Lots of little things have been happening this week. 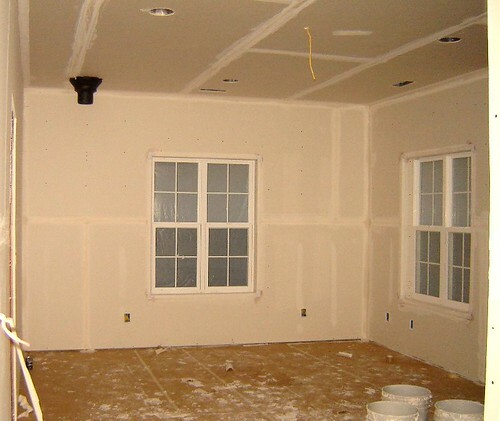 The Sheetrock is pretty much done and the finishers have started mudding at an alarming rate. They had the floor covered, taped and had started the ceiling and mid wall tape before I left with mom this morning at 10:00 a.m. to go visit the Dr and do some fun shopping. This is mom's living room all mudded. They will adding bull nose trim to all the corners and and egg shell finish to the walls. I came home from work yesterday morning to a big surprise. I knew they were working on the wall outside my kitchen but I didn't know they were tearing out my kitchen right at that moment. I came home and my upper cabinets were gone. I spent the rest of the day madly trying to box up the rest of my kitchen so they can take out that wall tomorrow morning. They finished the ceiling insulation today so we won't freeze to death tomorrow when the wall comes tumbling down. Time to break out the bread machine and the crock pot for dinners. 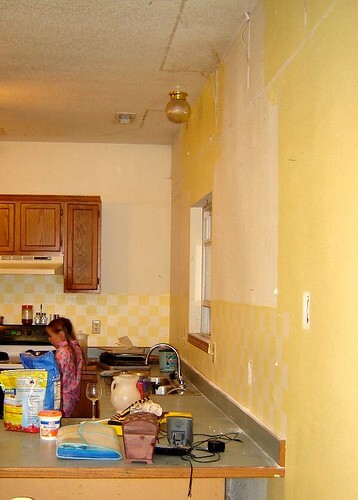 My kitchen is going to be out of commission very soon. YIKES! Jeddie was very worried about the wall shaking. 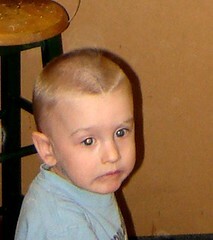 He really freaked out when he saw the saw blade come through the wall. When mom and I got home at about 5:30 tonight we found a real treat!! 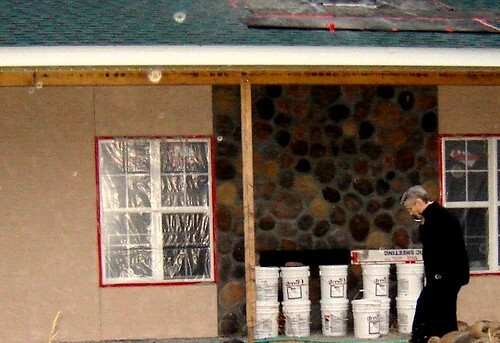 The stucco man came and start to apply the final coat of stucco. Mom was really not liking the gray under coat. She said it looked just a little too "San Quinton". Here I caught her checking out the new color. It was still wet. 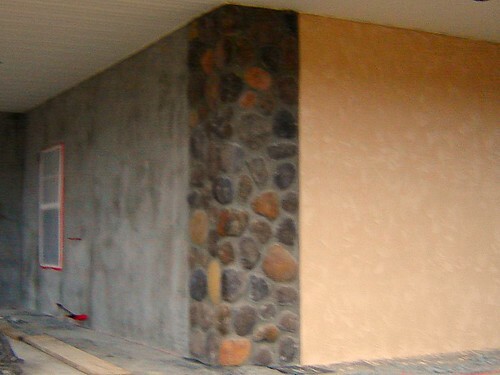 Here you can see the "San Quinton" gray and the "pancake" stucco side by side. The new color is fabulous but will take a couple of days to get used to. While in Joplin today we checked out the wood stove store (Joplin Fire Place) They had some very beautiful stoves there. They guys there were really great and asked what she needed one for and what her intent was in using it and quickly directed us to the two stoves that would suit her needs. The buck stove model 21 is nice and small and easy to clean up and to use. It's drawback is that it only has a 6 hour burn time and heat time. 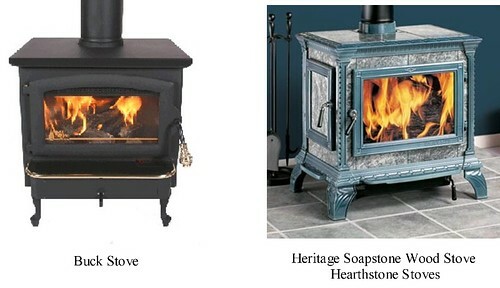 The Hearthstone stove was gorgeous and I think someone fell in love with it. It is a soap stone stove that will hold soak up the heat and radiate it out much longer. It's burn time is 8 hours and it's heat time is 12. That would keep the home warm through the night. The house does have a heat and air system that is fabulous but you can't been the warming capability of a crackling fire. I love the windows in the doors. I love to see the fire burn. This will probably require a lot more investigating but I know which one mom likes best. It is a thing of beauty. The stove they had on the floor had shinny black enamel cast iron. The one in the picture has the sea foam enamel. I think mom likes that color better. It is beautiful. I know what I want to save my pennies to get. They had a slightly larger one that I am loving very much. Someday. I had to go back to your first post and read them all! This is fantastic. What a great idea to keep up with the construction in a blog! The house is beautiful, I LOVE the stone. And the idea to cover the pipe by making a chimney is awesome! I'm so I came across your blog. Can't wait to read more! Hey are there any updates? We'd love to see what's going on inside.